If you love taking a vacation but hate the bill that comes at the end, try the Vacation Budget template to save yourself some money this year. This free template will help you create a customizable budget sheet specifically for the vacation you desperately need. By simply jotting down your expenses and watching as they compile, you will know exactly how much you’re spending at all times. The budget template even calculates your totals for you, making your day even easier. You will also receive multiple graphs to show the percentages of your expense items weighed against your initial budget. Stop wasting money on the little stuff and start enjoying your vacation by using the Vacation Budget today. Downloading the free template file to your computer is as simple as clicking the link provided below. The document consists of only one page so it will be really simple to enter your information. You actually just need two pieces of information. You will start at the top of the page by entering the total amount you plan on spending for your trip. You only need to enter the description of your expense, which can be anything from a name to a specific product number (it’s up to you). The other thing you need is a category. There are helpful drop-down menus for you to quickly write down all your expenses. You will also be able to list a quantity for each item as well. For example, if you have to pay for multiple nights at a hotel, you would simply enter the number of nights for your stay. The template will use the information you enter to calculate the final total for you. Going back to the top of the page, you will find that the template has calculated your total expenses and the difference from that figure and your initial budget. 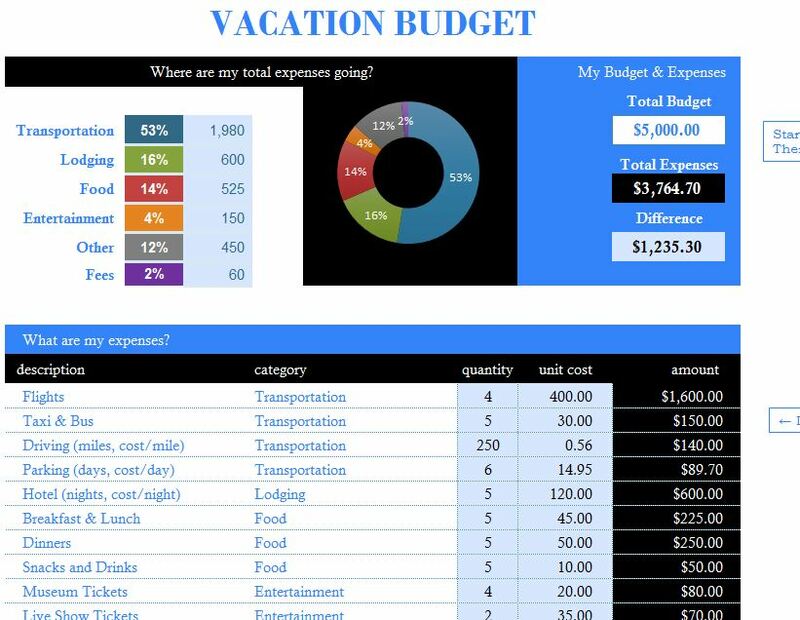 Now you have the proper tools to save on your vacation, with the budget template at your side!